Submit pending aassignmetn by 20th April. Submit next set of assignments by 14th April. come up with 5 different abstract compositions for the same. submit them by 12th April. 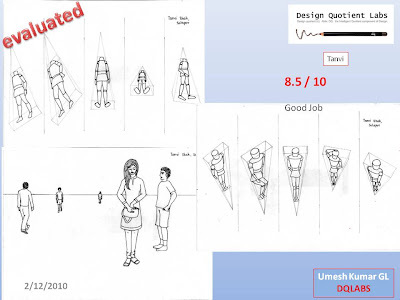 Submit hte sketch as per the feedback by 6th April. use the design principles and do hte 2d composition using numbers 3,6,0. color it and submit it by 29th MArch. Good Job. i have sent you next set of assigments. Submit them by 11th March. Update the below drawings as per the feedback. Also i have send you a new set of assignments. Submit all by 1st March. good job!. i have sent you a series of assignments submit them by 8th Feb. Correct the images as per the feedback and submit them by 25th Jan. I have sent you new set of assignments, submit them by 18th Jan. I have send you some assignments by email. submit them by 18th Jan. 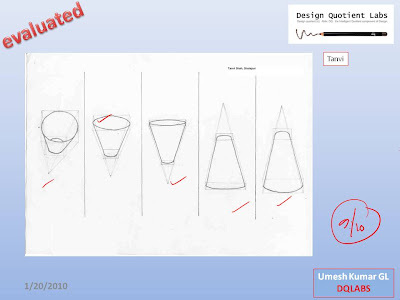 I have submitted my sketches on Friday 8 January 2010. Have not got the evaluated yet. I have submitted the corrected perspective drawing and two more assignments... waiting for eveluation. i have not received the new ssignment yet...could u please send it to me again? I would be submitting the design principles assignment tomorrow. I intend taking NATA on April 30th. Would it be possible to complete all the remaining assignments by then? Or do you suggest I take it later. I have my A level CIE examination in May. that would be good enough, however, when are you planning to Join architecture school, in this year or 2011? I would be joining undergrad Architecture this year .. 2010.
ok. can you give me a call on skype at 9 AM GMT on sunday, i would like to know about your preperation. Sorry .. I saw your message late on Sunday and then the broadband at my home had problem for 3 days. Is it convenient to talk to you on skype in the evening or tomorrow morning please? I wanted to appear for NATA on April 30th, however the test centre at Solapur is still in the process of registration. I have my CIE A level exams starting on May 12 and need to concentrate on the studies. I will be taking NATA on June 15, 2010. I am done with my A level exams yesterday . appearing for NATA on Monday 14th June. What should I practice over the weekend.